The last few months of 2015 proved to be tumultuous for Frew Publications, the Australian publisher of The Phantom comic magazine. Dudley Hogarth had only recently taken over the reigns as editor from Steve Shepherd (son of the late Jim Shepherd), when Judith Shepherd announced she would standing down as Managing Director of Frew Publications in December 2015. This announcement was published in The Phantom, #1744 – the 2015 Christmas Special, which went on sale in Australia and New Zealand on 17 December, 2015. And then…nothing. 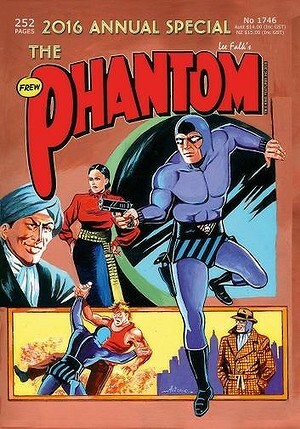 Weeks passed, and no further issues of The Phantom were to be seen in newsagents or comic-book stores anywhere. Frew Publications posted an announcement on their website, indicating that publication had been temporarily delayed, but assured readers that production would resume in the very near future. With no further details forthcoming, the rumour mill went into overdrive. Had Frew Publications gone out of business? Was this the end of The Phantom comic book in Australia? What would happen to readers’ outstanding subscriptions? ChronicleChamber.com released an episode of its X-Band podcast on 22 January, 2016, where the announcers disclosed that changes were underway at Frew Publications, and assured listeners that Frew Publications had not closed its doors. But still rumours about the company’s – and The Phantom’s – future continued to circulate on Facebook pages dedicated to The Phantom. I can FINALLY announce that Rene White and I are the new owners of Frew. Our apologies to everyone who has been ‘curious’ about the state of the company and thank you all for your patience. The last month has been quite a ‘journey’. By way of a quick explanation, I can say the following: As I’m sure most of you are aware, the business of printing the Frew Phantom comic involves two things, there’s the business owned by Frew, the company, and there is the Phantom licence, granted by King Features Syndicate. One is not much good without the other. We were approached last year, by Frew’s proprietor and asked if we were interested in buying the business and taking over the licence. There were other interested parties, but we threw our collective hat into the ring, as well. Unfortunately for us, early last December, we were told that one of the other interested parties had been granted the licence. We were disappointed, of course, but went on with our lives. We were then contacted by KFS in mid-January and asked if we were still interested as the other party had changed his mind and had backed out. We then went into negotiations with KFS, who wanted the contract revised. This took a month of to-ing and fro-ing, but we have all reached an agreement. We are all happy and the licence is now signed. We were not able to make an announcement of any sort, until after we had successfully completed negotiations with KFS, as well as the proprietor of Frew. Dudley’s original message still applies: Issue #1745 will be available on February 25. We have just pushed the GO button at the printer’s. The printing will be finished this Wednesday. The pick-up and delivery by Gordon and Gotch, however, takes a week. It is taken to a central warehouse and then distributed, from there, throughout Australia and New Zealand. The 2016 Annual (issue #1746) will follow pretty quickly – and yes, there will be an 80th Anniversary Special. We are working on this now and we are hoping to knock your socks off with it! Other announcements and publishing schedule information will be made available as soon as it’s confirmed. Now to the ‘punch line’: We are delighted that Dudley is staying. Between the three of us, we are confident that we can not only maintain the quality that Jim and Judith Shepherd established, many years ago, but also continue the legacy for many, many years to come. We have a lot of ideas, some of which, we hope, will surprise you and some we feel are expected and perhaps long overdue. The most important aspect of all of this, though, is that YOU now have an opportunity to get your voice heard. If we are to grow this business, we need to hear from you. To this end, we intend to make our website and Facebook page a bit more reactive and responsive. Letters, emails, faxes, smoke signals, etc, are not only welcome but encouraged – we need the feedback. Do we need a forum – and if so, in what form? This may even lead to polls, surveys, competitions – anything which will give us an idea of what you want – and constructive contributions will be rewarded with prizes. We are still formulating a lot of this – it’s early days – but we are excited. It’s going to be a good year for the Phantom!!! The announcement coincided with the 80th anniversary of The Phantom comic strip, which was widely covered by Australian newspapers, including The Sydney Morning Herald, and The Advertiser (South Australia). Frew Publications will resume production of The Phantom later this month (commencing with issue #1745), and will release a special 80th anniversary edition of The Phantom (see accompanying image) shortly thereafter. While Australian “phans” are no doubt relieved by this news, this announcement points to intriguing new creative possibilities for The Phantom and Frew Publications – not least because we now have a former Australian artist on The Phantom comic book appointed a co-owner of the company which has produced this magazine since 1948. Glenn Ford has been an active figure in Australian comics fandom since the mid-to-late 1970s, and launched The Phantom Zone chain of comic book/pop culture retail stores in 1989. It will be interesting to see whether Glenn Ford and his team (Dudley Hogarth has been retained as editor) can successfully chart new directions for Frew Publications and The Phantom comic magazine in a challenging (digital) media environment.